AFH LIBRARY - Oral Dosages of Bicarbonate. "Magnetic resonance spectroscopy (MRS) has shown that the pH of MCF-7 human breast cancer xenografts can be effectively and significantly raised with sodium bicarbonate in drinking water." - Enhancement of chemotherapy by manipulation of tumour pH. 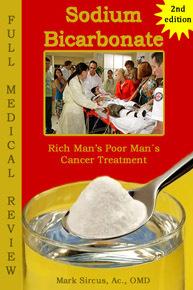 Many people write to me asking about dosages for sodium bicarbonate and I tell them to read Sodium Bicarbonate - Rich Man's Poor Man's Cancer Treatment. Below is some information from that chapter with some additional information that I hope people will find useful. I have resisted responding to many people in this regard for there are many variables one has to consider when addressing the issue of dosages and this type of question is best answered by ones personal healthcare provider. The best guidance for dosages for sodium bicarbonate is provided by one's own urinary and salivary pH, which one takes in the morning or several times during the day when doing a heavy course of dosages for cancer or other serious diseases. One needs to buy inexpensive pH paper strips for this. Because Natural Allopathic Medicine is designed for self administration I include as much information in my books as possible so people can find their way without having to depend on physicians but again it is always helpful to have good support when treating serious conditions. There is no question that plasma bicarbonate concentrations are shown to increase after oral ingestion. The most important effect of bicarbonate ingestion is the change in acid-base balance as well as blood pH and bicarbonate concentration in biological fluids.1 In Europe, spa-goers drink bicarbonate-rich water to heal ulcers, colitis and other gastric disorders. Ingesting bicarbonate by way of bathing stimulates circulation, possibly benefiting those with high blood pressure and moderate atherosclerosis. While the body does have a homeostatic mechanism which maintains a constant pH 7.4 in the blood, this mechanism works by depositing and withdrawing acid and alkaline minerals from other locations including the bones, soft tissues, body fluids and saliva. Therefore, the pH of these other tissues can fluctuate greatly. Some believe the pH of urine remains at the acidic end of the scale because it is a reflection of the body eliminating unwanted acids, and therefore is not an accurate measure of the body's pH. The pH of saliva offers us a window through which we can see the overall pH balance in our bodies. When healthy, the pH of blood is 7.4, the pH of spinal fluid is 7.4, and the pH of saliva is 7.4. Thus the pH of saliva parallels the extra cellular fluid. The pH of the non-deficient and healthy person is in the 7.5 to 7.1 slightly alkaline range. The range from 6.5, which is weakly acidic to 4.5, which is strongly acidic represents states from mildly deficient to strongly deficient, respectively. Most children are at a pH of 7.5. If the saliva pH is too high, the body may suffer from excess gas, constipation and production of yeast, mold and fungus. The following testimonies from the bicarbonate book highlight bicarbonate's use as a pain reliever: "After suffering from a 4 hour long blinding headache for which nothing I took brought any relief, I tried the sodium bicarbonate, 1 tsp mixed in a glass of water. Within a few short minutes I could feel the headache abating and within the hour it was completely relieved! I tried this again when another headache occurred, and it worked just as miraculously." "This is the best pain reliever of all the ones I have been trying. I am amazed that something so simple would be so potent! I haven't exceeded 7 a day; but wish I could. It takes the pain away for about 2 hours. Nothing seems to work more then 2 hours at a time." Sodium bicarbonate can be used orally in doses of 1/2 tsp in 4 oz of water every two hours for pain relief as well as gastrointestinal upset, not to exceed 7 doses per day. That's basically the recipe on every box of Arm and Hammers sold in every supermarket in the country. Add 1/2 teaspoon to 1/2 glass (4 fl. oz.) of water every 2 hours, or as directed by physician. Dissolve completely in water. Accurately measure 1/2 teaspoon. --Three 1/2 teaspoons if you are over 60 years. Dr. Parhatsathid Nabadalung, "The best time to take it is whenever your pH is most acidic, which is during the night. It is best used when pH is around 5.6-5.9 (urinary). However if the pH is below that then somewhat stronger alkalinity is needed. In which case, I turn to potassium carbonate, potassium bicarbonate and sodium bicarbonate mixture. So if you take these, then both your salivary and urinary pH optimum should aligned close to each other. The usual dosage for me is 1/2 teaspoon (of potassium bicarbonate), 1/2-1 teaspoon of sodium bicarbonate, now if my pH is very acid, I add 1/8 teaspoon of potassium carbonate." Dr. Napatalung began using baking soda as far back as 1969 to relieve colds and various ailments including cancer. Dr. Reams began using lemon formula with bicarbonate to treat in the 70s thousands of cancer patients to effect changes in the basic biological terrain. As to the alkalization formula Dr. Napatalung has used citrates, carbonates, bicarbonates, potassium, sodium, and magnesium. One can read many comments about using apple cider vinegar with bicarbonate as well as some people's personal struggles at the Earth Clinic site. One of the great questions for cancer patients when considering oral intake of bicarbonate is whether or not to take it with maple syrup, molasses, honey, just water or even with lemon. This question is important for patients with cancer for often their cells are starving for glucose and perhaps because the sugar acts as a kind of Trojan horse getting the cancer cells to open their mouths wide. Then the increased O2 enters more easily. This topic is presented in depth in my book. Though I have published about the folk formula using maple syrup I do not recommend that. I recommend either black strap molasses (because you don't have to cook it and because of its rich mineral status) or just with mineral or distilled water. Bicarbonate with molasses fulfills the role of the glucose, which Dr. Simoncini always used when giving bicarbonate intravenously. Distilled water is excellent for treating disease "if" one adds bicarbonate and some pure magnesium chloride to it to enrich and harden it. One could even add a bit of sodium thiosulfate. When our water becomes a medicine benefits flow that are retarded when ones air and water supplies are tainted. Many ask what a maintenance dosage would be or a cancer prevention dosage. Again this would vary widely but one teaspoon split into two dosages could be a standard but one still has to measure ones pH for guidance. Sodium bicarbonate is not a substitute for an alkaline diet nor is it a substitute for exercise and proper breathing which both increase a persons CO2 levels and thus O2 levels. One practices strong medicine if one is in tune with ones own pH levels and use that as a guiding light in terms of dosages. Such a simple method can compete with so many tests that allopaths are obligated to do at great expense to the patient or society that pays for them. And still all these official tests ignore something so basic to human health. My recommendation is to always use bicarbonate in one way or another because our world is acidic, our food, air and water and even emotions tend to be acidic. I brush my teeth and load up my water pick with bicarbonate and use it as a deodorant as well as take perhaps a half teaspoon a day when I am paying attention to my health. Whenever there is a health problem I always include it in my protocols for one can hardly go wrong with it. That said it is important to realize that there can be side effects and that one has to monitor with applied sensitivity their feelings and reactions to whatever one takes. A major point I make in the book is that bicarbonate is best taken in conjunction with other medical and healing substances. The primary substance we need to think about, when taking bicarbonate, is magnesium chloride. The two together offer tremendous returns for they cooperate together right down to the mitochondrial level meaning they make the perfect mitochondrial cocktail. What ph level should we get the urine or saliva up to? Your ph can go too high, which also invites certain illnesses and imbalances in the body, and this is the purpose of the monitoring with the pH paper - to keep ph in a proper, healthy range. For our purposes with my protocol we will measure urine and saliva pH and depending on how closely you want to monitor, this can be more than several times a day. In Sodium Bicarbonate, Rich Man's Poor Man's Cancer Treatment there is a model provided by a gentleman who used bicarbonate and black strap molasses. His testimony tracks his pH testing and bicarbonate dosage with the attempt and success of reaching urinary pH readings of over 8. The idea though is not to keep it there nor maintain proper pH through the use of bicarbonate alone. There is no compensation for a lack of exercise, improper breathing and bad dietary choices. Using bicarbonate indefinitely as compensation will not yield desirable results. That said, in our toxic polluted acidic world sodium bicarbonate should be held close by and used in a variety of different ways for oral and overall body care. times a day so you can get a feel for what your average is. pH levels in your saliva can be affected by bacteria in your mouth as well as food you recently ate. In a perfect world with all other health parameters in place, the "averaged" pH of both urine and saliva will be right around what? That's a good question and is best answered perhaps not by a pH strip but by ones optimum feelings and state of being. Some people think that a pH as low as 6.4 is a good urinary target but there are some large assumptions that can put us into doubt about this. Getting this one right is important because Oxygen levels in the body are directly related to pH. Increasing pH from 4 pH to 5 pH increases oxygen to the cells by ten fold. From a 4 to a 6 increases oxygen by 100 times and raising pH from 4 pH to 7 pH increases oxygen levels by 1,000 times. and food supplements cannot effectively assimilate. Understand that pH can move all over the place.2 This is so because most individuals "total alkalinity" is not very strong and that is exactly what bicarbonate therapy as well as exercise, dietary sanity and good breathing promote, total alkalinity. So for instance two hours after a meal you may find the urine going acid as it is a reflection of the meals acid components pushing the pH. Now really, with life threatening situations especially, we don't want to be eating meals with large acid components so our urinary drift into the acidic with meals can be very mild if one is eating and even fasting correctly. The food we consume stores the flame of the sun. The more perfect our body's biological terrain, the more capacity we have to extract that flame to give us vibrant health and energy. Likewise we can eat close to the sun. Spirulina, for instance, from a esoteric energetic perspective can be viewed as practically crystallized sunlight that is most easy for the body to extract from. Its one of the reasons it makes a perfect survival food but as a mono fasting food it practically becomes the perfect medicine. When we eat this way or raw food our intake is highly alkaline so the acids being cleared in the urine would be more from the detoxification of the tissues than from the food. Sustained high urine pH is not what we are looking for though we do want to maintain "total alkalinity." One does not want to go over the deep edge with an alkaline urinary obsession. Some practitioners say you do not want to see urine above 6.5 for long periods of time and we should expect urinary changes up and down strongly depending on ones diet. We should not be surprised or disturbed when we see urinary pH getting down into the 5 range sometimes as this is a reflection of kidney capacity and it shows metabolic acids can and are being removed from the system. You want your urine able to move acid, and to essentially be acid when appropriate. If you are keeping urine above 6.5 and day to day are into neutral pH (7) or above numbers, this is actually not normal unless one is eating very purely. But for cancer treatment we want to break past this and establish a pH of around 8 for two weeks and then take a break letting urinary pH fall. The chapter on pH in the bicarbonate book deals in depth with this very important indicator of health. Correct Magnesium Levels: Highly absorbable magnesium chloride (magnesium oil) helps to build necessary acid buffers. Magnesium is often lost in urine as a consequence of too much acid in the body. If your urine is too acid you are losing magnesium. Soak in a tub of warm water with one cup or more of Magnesium (oil or flakes) and one cup of baking soda. Use warm, not hot water especially for diabetic patients, as the soak will cause vasodilation of all of the surface blood vessels and they might faint when they stand up. This soak will pull the acidic toxins out of the body and put magnesium into the body (thus putting buffering alkaline magnesium into the body's circulation) through the process of osmosis. Click on the books for information. 2 The average of the five days of saliva pH will give you an idea whether your physiology is being dominated by emotions. If emotional overload is a factor, this also needs to be addressed to prevent the patient from being disillusioned after trying to raise his/her urine pH and not getting anywhere. A simple key is when the pH readings vary greatly on arising each morning, It is almost certain that anxiety is influencing the individual's physiology. From Tanita, The Body Fat Experts, comes the BC 533 Innerscan Body Composition Monitor. Using Bioelectrical Impedance Analysis (BIA) technology which is widely used in the medical field, the scale is a unique and highly accurate body composition monitor. This product not only measures weight and body fat, it also tells you your body water %, muscle mass, bone mass, daily caloric intake, metabolic age, visceral fat and rates your physique! The Body Water % is the total amount of fluid in the body expressed as a percentage of total weight. The muscle mass is the amount of muscle in your body. The Bone Mass is the weight of bone in your body. The Metabolic Age compares your Basal Metabolic Rate to the average age associated with that level of metabolism. The Visceral Fat is the fat in the abdominal cavity (stomach), surrounding the vital organs. The Physique Rating is a rating of your body type; 1-9. Its sleek, modern design of glass and silver accents is a complement to any bathroom. Monitor your health and fitness with a Tanita Innerscan Body Composition Monitor. The scale has an Easy to read 2.25 LCD Display with the 4 person memory. The Weight, Body Fat and Body Water Recall function allows users to see the previous result. The scale has the Weight Capacity of 330 lb with the increments of 0.2 lb. The Body Fat and Body Water readings are in increments of 0.1%. The Healthy Range Indicator bar shows where the body fat % fits into the healthy body fat range. The scale has a Guest Mode as well as Child and Adult mode. The Weight Only Mode allows you to use the scale a regular bath scale. The scale includes 4 AA batteries. Keep tabs on your body composition and health on a path to a better you.